Robert Chamblee was born circa 1738 in Bertie County, North Carolina. He married Ester Warren, daughter of Benjamin Warren Sr. Robert Chamblee died in 1819 in Wake County, North Carolina. Ester Warren was born in 1740 in North Carolina. She married Robert Chamblee. Her married name was Chamblee. Ester Warren was the daughter of Benjamin Warren Sr. Ester Warren died in 1788 in North Carolina. Blake Bagwell was born circa 1792 in Halifax County, North Carolina. He was the son of John Daniel Bagwell and Rachel Chamblee. Robert Johnson Bagwell was born in 1793 in Anderson County, South Carolina.1,2 He was the son of John Daniel Bagwell and Rachel Chamblee.2 Robert Johnson Bagwell married Sarah Chamblee in 1820 at Anderson County, South Carolina. Robert Johnson Bagwell lived in 1850 in Gwinnett County, Georgia.1 He died in 1860 in Gwinnett County, Georgia. [S462] United States Federal Census, Washington, District of Columbia, Population Schedule: Berkshire, Gwinnett, Georgia; Page: 263, Dwelling: 19, Family Number: 19, Date: 1850. [S465] Edmund West, Family Data Collection - Individual Records: Larkin Bagwell. Mary (Polly) Bagwell was born circa 1797 in Anderson County, South Carolina. She was the daughter of John Daniel Bagwell and Rachel Chamblee. Her married name was Broughton. Mary (Polly) Bagwell married Benjamin Broughton. [S3631] James P. Faust, The Fighting Fifteenth Alabama Infantry. Clarissa (Clara or Kitty) Bagwell was born circa 1805 in Anderson District, South Carolina.1 She was the daughter of John Daniel Bagwell and Rachel Chamblee. Clarissa (Clara or Kitty) Bagwell lived in 1850 in Eastern Sub Division, Anderson District, South Carolina.1 She died in 1903. [S1288] Larkin Bagwell Grave Stone, Find a Grave, www.findagrave.com. [S328] United States Federal Census, Washington, District of Columbia, Population Schedule: Morgan, Hall, Georgia, Enumeration District: 134; Supervisor District: 1; Page: 21, Dwelling: 197, Family Number: 197, Date: 1880. [S331] United States Federal Census, Washington, District of Columbia, Population Schedule: Hall County, Georgia, Page: 167, Date: 1840. [S330] United States Federal Census, Washington, District of Columbia, Population Schedule: Gwinnett County, Georgia, Page: 357, Date: 1830, Hinson Bagwell - 1 male under 5 years old ; 2 males between 20-30 years of age, 1 female between 20 - 30 years of age. [S331] United States Federal Census, Washington, District of Columbia, Population Schedule: Hall County, Georgia, Page: 167, Date: 1840, Males: 1 between 5-10 years old; 1 between 10-15 years old; Females: 1 under 5 years old, 1 between 20-30 years old. [S326] United States Federal Census, Washington, District of Columbia, Population Schedule: District 38, Hall, Georgia, Page: 744, Dwelling: 65, Family Number: 65, Date: 1850, Page 371. [S608] United States Federal Census, Washington, District of Columbia, Population Schedule: Eastern Subdivision, Anderson, South Carolina; Page 241; Dwelling Number: 34; Family Number: 34, Date: 1850. Berry Bagwell was also known as Asbury Bagwell. He was born on 22 July 1817 in Old Pendleton District, Greenville County, South Carolina.1,2,3 He was the son of John Daniel Bagwell and Rachel Chamblee. He served in the Indian War in Florida in 1835. He also fought at Gunter's Landing in Arkansas in 1836-1837.1 Berry Bagwell married Phereby Emeline Strickland, daughter of Irvin Strickland and Martha Patsy Crow, on 22 December 1842 at Hall County, Georgia.2,3,4 Berry served with Company C of the 1st Georgia Reserves. He was promoted to Corporal on Nov. 27, 1861. [S1545] United States Federal Census, Washington, District of Columbia, Population Schedule: Wilsons, Hall, Georgia; Enumeration District: 136; Supervisor District: 1; Page: 97A, Dwelling: 78, Family Number: 80, Date: 1880. [S1737] United States Federal Census, Washington, District of Columbia, Population Schedule: Wilson District, Hall County, Georgia; Page: 224, Dwelling: 1807, Family Number: 1675, Date: 1870. Child of Benjamin Warren Sr.
Elizabeth Bagwell lived in 1860 in Knoxville, Greene County, Alabama. [S23] Doyle Baker, "Bagwell Report (email for Emanuel Bagwell Family History)," e-mail to Ann Reese, May 7, 1999, eMail address is not longer valid. William Don Galloway is the son of William Homer Galloway and Ella Irene Baker. William Don Galloway married Judith Lavelle Taylor on 28 September 1963 at Panama City, Bay County, Florida. [S469] United States Federal Census, Washington, District of Columbia, Population Schedule: Wilsons, Hall, Georgia; Enumeration District: 136; Supervisor District: 1; Page: 12, Dwelling: 100, Family Number: 102, Date: 1880. [S1929] John A. Bagwell Grave Stone, Find a Grave, www.findagrave.com. [S1931] Callie Hamilton Bagwell Grave Stone, Find a Grave, www.findagrave.com. [S1930] Email from Dale and Patricia Harrison dated June 2011 to Hunter Wayne Bagwell - Subject Line: Descendents of James Daniel Bagwell. 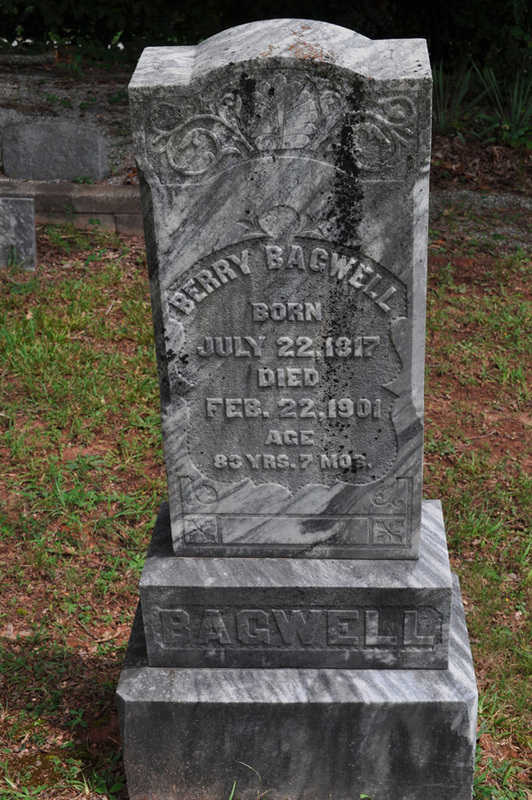 [S1932] Henry Ernest Bagwell Grave Stone, Find a Grave, www.findagrave.com. [S1933] Bonnie Mae Bagwell Smith Grave Stone, Find a Grave, www.findagrave.com. [S1935] Thomas A Bagwell Grave Stone, Find a Grave, www.findagrave.com. Frances J. Bagwell was born in 1867 in Georgia.1 She was the daughter of Micajah C. Bagwell and Nancy Evelyn Whitmire. Mary E. Bagwell was born in 1869 in Georgia.1 She was the daughter of Micajah C. Bagwell and Nancy Evelyn Whitmire. Her married name was Bagwell. Nancy Evelyn Whitmire was born in 1830 in South Carolina.2 She Information on family at GA State Archives suggests that family came to GA from Aiken, SC, Philadelphia, Germany. She married Micajah C. Bagwell, son of Henson Bagwell and Lavissa Clark, on 13 July 1848 at Hall County, Georgia.3,4,5,6,1 Nancy Evelyn Whitmire died after 1910. [S467] United States Federal Census, Washington, District of Columbia, Population Schedule: District 565, Hall, Georgia, Page: 178, Dwelling: 1346, Family Number: 1141, Date: 1860. [S34] Martha Louvenia Bagwell, Alabama Death Certificate: Martha Louvenia Bagwell. [S55] Unknown author, Hall County Georgia Marriages, Part 2. 1840-1870, Location: GA Hall, Film: 1697346 Item 14. [S56] Unknown author, Hall County Court of Ordinary. General Index to Marriages Number 1. 1819-1965. A-K, Location: GA Hall, Film: 0424626, Typed index from records once at GA Archives, originals apparently destroyed. Said to have been on Book A, page 157. [S28] Unknown author, The Devotional Family Bible, Family Info: Galloway family bible, Present Owner: W. Don Galloway, Location: Darnestown, MD. [S29] Unknown author, Death Certificate, William Homer Galloway, Record Type: Death Certificate, Name Of Person: William Homer Galloway, Number: 5261377, Certificate #5261377, Book 1535, Page 1195. [S518] United States Federal Census, Washington, District of Columbia, Population Schedule: Euharlee, Bartow, Georgia; Emuneration District: 8, Supervisor District: 7, Sheet: 16A, Dwelling: 277, Family Number: 281, Date: 1910. [S519] United States Federal Census, Washington, District of Columbia, Population Schedule: Euharlee, Bartow, Georgia; Emuneration District: 10, Supervisor District: 7, Sheet: 16B, Dwelling: 307, Family Number: 310, Date: 1920. [S30] George Riley Baker, Alabama Death Certificate - George Riley Baker. [S520] World War I Draft Registration Cards, WW I Draft Registration: George Riley Baker, Roll: 1556959; Draft Board: 0. Her married name was Baker. Della Odessa Pruitt was born on 28 February 1883 in Gainesville, Hall County, Georgia.1,2,3 She was the daughter of John Willis Pruitt and Martha Louvenia Bagwell. Della Odessa Pruitt married George Riley Baker circa 1902.1,3 Della Odessa Pruitt died on 1 September 1968 in Gadsden, Etowah County, Alabama, at age 85. [S32] Elizabeth Naylor Rice, Information provided by Elizabeth Naylor Rice, 10/86, Interviewer: Ella Galloway, Informant Address: Lakewood, OH. James Edward Pruitt was born on 1 November 1879.1 He was the son of John Willis Pruitt and Martha Louvenia Bagwell. Cleo Pruitt died in 1885.1 She was born in 1885.1 She was the daughter of John Willis Pruitt and Martha Louvenia Bagwell. Alexander McCager Pruitt Probably named after grandfather, Macajih Bagwell. He was born on 2 March 1887 in Georgia.1 He was the son of John Willis Pruitt and Martha Louvenia Bagwell. John Milton Baker was born circa 1903 in Georgia.1,2 He was the son of George Riley Baker and Della Odessa Pruitt. [S33] Unknown author, Cullman County Cemeteries, Volume III, Page 160. Stella Pruitt Two marriages: Denning and Presley.1 She was born on 9 July 1898.1 She was the daughter of John Willis Pruitt and Martha Louvenia Bagwell. Stella Pruitt appeared on the census of 1900 Stella May, daughter of John W, born July, 1898, age 1.